With a high overload capability, the Triathlon Precision AC Power Source has the qualities of fully adjustable output voltage and output frequency. Digital displays for voltage, current, frequency and wattage makes this power source an excellent choice for your frequency converter needs. Adjustable Output Frequency Converter, from 40 to 500 Hz. 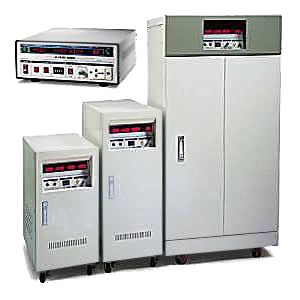 Contact Georator today to learn more about our adjustable frequency converters, variable frequency converterS & AC power converters.